Twenty-five years ago, we wrote Procrastination: Why You Do It; What To Do About It. Our book described the reasons behind procrastination and offered practical techniques designed specifically to help procrastinators overcome this self-defeating behavior. We had no idea that this book, born out of our own struggles and our counseling experience with many procrastinators, was going to become a “classic” that sold over 150,000 copies. At the same time, society has become more competitive, and the current economic climate makes procrastination in school or at work a risky practice. We want to address the current explosion of procrastination possibilities and make suggestions that work for the way we live today. Increasingly, people move across the country or to other countries, experiencing social ruptures that can contribute to procrastination. We want to include information that helps procrastinators who are going through cultural challenges. In 1983, there was almost no research in the area of procrastination. 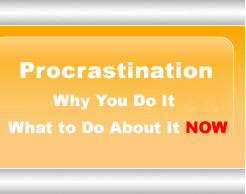 Since then, there have been hundreds of research studies focusing on many variables related to procrastination. We want to present the most significant findings from the fields of psychology, neuroscience, and behavioral economics. Our book has two parts: Part One, Understanding Procrastination, has 10 chapters that consider the complex factors that lead people to procrastinate. Part Two, Overcoming Procrastination, offers a smorgasbord of techniques designed especially for procrastinators, helping you be more realistic and more aware of time, and laying out the steps that lead to action. Every chapter in our book has been updated with new information, new examples, and new suggestions. twenty-five years of research on procrastination from the fields of psychology, biology, neuroscience, and behavioral economics, with full references. Chapter 1 Procrastination: Nuisance or Nemesis? Chapter 6 Do You Know What Time (It) Is?